Save up to an additional 20%* off our great prices! Enter coupon code on the Shopping Cart page to save on your next order. 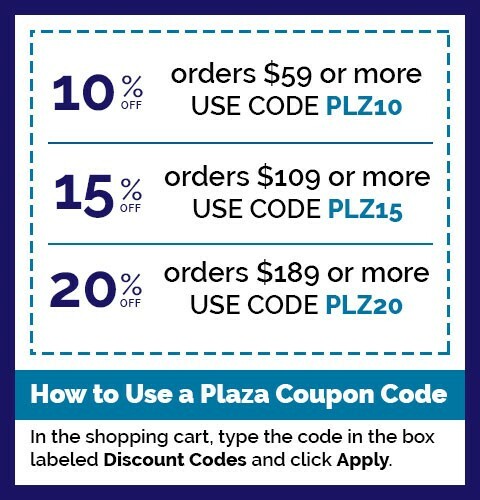 *Plaza Gift Card purchases do not apply to the dollar subtotal for coupon code use. 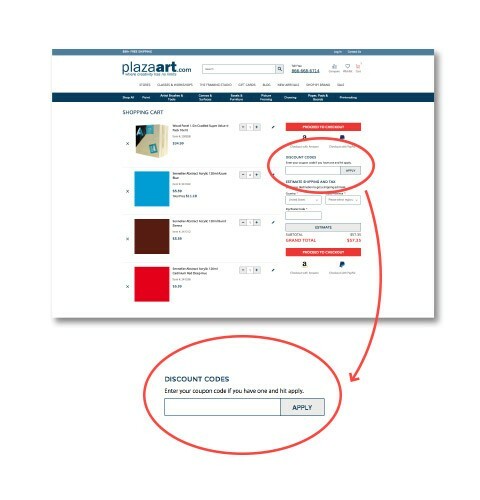 Coupon code discounts do not apply to Plaza Gift Cards, school and class kits, stretched canvas, studio furniture and equipment (including easels, tables, lamps, projectors and light boxes) and digital media (including Canson Infinity). Certain brands are offered at the lowest everyday sale price and are not eligible for additional discounts. These include Xyron, Stillman & Birn, Gamblin, Golden, QoR, Williamsburg, some Liquitex products, some Winsor & Newton products, New Wave palettes, Pina Zangaro, Daniel Smith, Rembrandt Oil Colors, Rembrandt Soft Pastels, Old Holland oil colors, R&F encaustics and pigment sticks, Midwest basswood, Montana Gold spray paint, Copic markers, Color-aid paper, Rapidograph pen sets, Plaza Studio Acrylics, Plaza Studio Gesso, Plaza Artists' Acrylics, Plaza Artists' Oils, Ulano, Excalibur screen printing inks and Iwata airbrushes. Additionally, coupon code discounts do not apply to the already discounted items featured in our periodic sales and promotions. Additional exceptions and restrictions may apply.